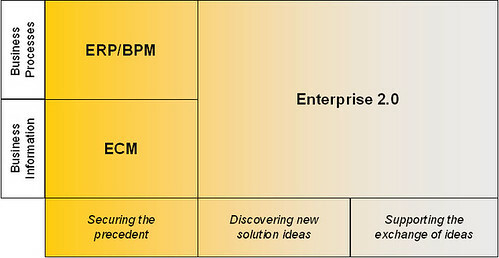 What is Enterprise 2.0 all about? IMHO – this is the most asked question when talking about this topic. As several bright heads have said before instead of theoretically talking about the Enterprise 2.0 vision we need to talk about use cases and case studies that show and unveil the power of this so-called “social business“. At the Enterprise 2.0 SUMMIT we have defined four different use cases that are going to be discussed along different best practices presentation. And while setting up an explanation of these use cases two days ago I ran along this nice post of Larry Hawes discussing the “nexus of business process & ad-hoc collaboration” that led me to an idea of a more broader view on the topic to be discussed in the following. ECM enables controlled, repeatable content publication processes, whereas social software empowers rapid, collaborative creation and sharing of content. There is a place for both in large enterprises. Sameer’s suggestion was that social software be used for authoring, sharing, and collecting feedback on draft documents or content chunks before they are formally published and widely distributed. ECM systems may then be used to publish the final, vetted content and manage it throughout the content lifecycle. This relates to my understanding why enterprises need such thing as social software – because they need to change and to innovate in order to be more competitive in their markets. Consequently they have to discover new opportunities, ideas and information that is describing or representing these. And as a result from the organizational perspective companies need some kind of “reframing” of their business model. Inspired by the post of Larry Hawes I would therefore describe the difference between established enterprise business applications and Enterprise 2.0 on a dimension of how the application is supporting the “reframing” process (I am explicitly not talking about “change” or “transformation” here because IMHO “change” is a consciousness thing needed to be done before and “transformation” might go far beyond the needed “reframing” in order to be up-to-date to customer and market expectations). On this dimension established enterprise business application are “securing the precedent”. They support the planning-and-control-organization of the current operations by registering and certifiably documentating business incidents. The applications provide insights towards the historical status-quo of the business operations and can be distinguished by the business entity it is focussing on. On the one side there are established and defined processes and on the other side business-relevant data and unstructured information that have to be managed throughout their lifecycle. If we take the scenario of Larry Hawes regarding the customer service issue there are business incidents – commonly in the sphere of knowledge working – that exceed these pre-defined processes and information structures. For these incidents the staff needs to move beyond the status-quo of defined processes and stored information. Former approaches to this used special methodologies like delphi studies and artificial intelligence toforcast the future in order to discovery new opportunities. At this point – social software offers a new approach – as it provides a way of harnessing the collective power of a interconnected setting of people to discover and ventilate new ideas – by externalizing and opening up data about information chunks, knowledge and process execution towards the crowd. In regards towards this dimension of “reframe” I hence distinguish two further steps: first the “discovery” and second the “exchange”. This takes account of the idea of the learning organization that focuses on enhancing its systems to continually increase the organization’s capacity for performance. It also supports a phrase I first came along in a presentation of Lee Bryant: “It’s all about managing feeds & flows, and not objects“. This is about working collaboratively on a state of externalized business knowledge e.g. project/process documentation, service issue/process documentation or sales-orientated product & market documentation. Giving access and authoring as well as sharing possibilities to the crowd creates the chance of someone adding not expected, but very valuable information towards the knowledge base and therefore enhancing it. This is about the exchange and open discussion of new opportunities, ideas or gained knowledge throughout conversational systems as weblogs or microblogging infrastructures. This supports the distribution and ventilation of new ideas throughout the company – eventually reaching out to people that can give valuable feedback to ideas. This is about supporting ad-hoc initiated team working to solve issues and problems that go beyond the pre-defined scope of problems or issues. As this would have been solved in offline circles of expertise so far Enterprise 2.0 approaches allow this to be solved on in a digital Enterprise-wide manner. This is about interconnecting business entities with people and information about their tasks, interests and competences. Community-of-practices are a common tool for this approach though in times of social software this would rather implemented by an internal social network that is giving even a broader access to people and the relevant information flows within the enterprise. Just to be clear the above mentioned use cases are not directly linked to technological solutions but certain social software concepts fit better to the one or the other use case. Therefore wiki solutions provide a good approach towards the collaborative knowledge work. While weblogs and microblogging solutions are better in giving access to the flow of information. And social networks provide advantages for supporting collaboration and the learning organization. At the Enterprise 2.0 SUMMIT we will discuss different best practices for these four use cases and I will sum up my insights regarding the fit of this matrix towards the practical use out there in a post after the conference. But before this I would be very interested in your thoughts on this! habe dann heute morgen mal über E20 gebloggt (http://bit.ly/3iq4oi) – würde dazu gerne beim #bcmuc auch ne Session machen. Interesse? 1. The Knowledge Management Department (if a company has one of these). These are more frequently found in firms and agencies. They start the conversation from the perspective of document or records mgt and are looking to solve problems related to learning and on-boarding of new employees. 2. Idea Harvesting. Most typically in companies with an innovation management or new product department. These innovation or idea-focused initiatives look to leverage voice of customer (not really e2.0 per se) or voice of employee to help with new product development or other business initiatives. 3. Marketing departments and their Social media campaigns. Many times someone in the marketing department has some responsibility to ensure that there can be an effective internal reaction to an external project. This opens the question – which should we do first? Some groups have their internal comm group report into marketing — so they initiate the conversation as a “intranet home page refresh project”. Sometimes they look at E2.0 as an R&D project. 4. Virtual Teams collaboration. In some organizations this comes from HR or even a Project Management Office. The conversation is related to a global outsourcing project or some other workforce changes (layoffs, mergers) — it is related in spirit to the KM initiative, but given the source, the nature of the conversation is very different in practice. 5. Intranet / Portal 2.0. Many times the conversation starts from the IT department. They may be looking at a technology refresh or a desire to provide new services to the workforces (or more specifically a new portal/platform that happens to have social technologies. These are the 5 places within organizations that I find most frequently initiate the e2.0 conversation. The KM and Innovation cases match directly to mine. The other two use cases relate to my three sources (though I admit that my classification of 5 is not very strict either). So I like your uses cases since they are crisp. I like the piece in general, and I broadly agree with the four use cases, bit I think there are various affordances and effects of social computing that do not neatly fit into these categories, especially when defined as [old term] 2.0. I look forward to discussing it fully in Frankfurt! I still have a bit of a problem with limiting the definition of Enterprise 2.0 to social networks and collaborative tools. What about other technologies that extend the power of existing organizations’ applications? I really like this classification! Would you mind if I used it in a conference I’m speaking at next week? With the credits of course! @Xavier – you are welcome to use it – the images are linked to Flickr images with even bigger ones. Regards. I’m pleased and sincerely flattered that you were inspired by my blog post (as I was by Sameer Patel’s). There is much more thinking and communication to be done on the relationship of structured business processes and ad hoc communication/collaboration. Your inclination to define and apply high-level use cases as a guiding framework is spot-on and commendable. We need to discuss the issue in language that business people will understand and value. 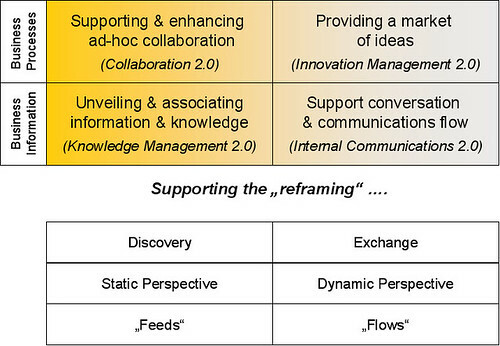 The reframing and use case frameworks you’ve proposed here are a really good start. However, the quadrant diagram with the four use cases seems to be missing a dimension. You have labeled the Y-axis categories (Business Process and Business Information), but have no label for the two categories on the X-axis. What business concepts could you apply to create a well-formed BCG matrix? I’ve been doing quite a bit of (unpublished) thinking on this subject lately that I would like to share with you, because it varies in one meaningful way from your frameworks. Namely, I don’t agree with your distinction between “securing the precedent” and new ways of “discovering and exchanging ideas”. In my draft framework (and ideal situation), Command and Control (structure) and Social Business (dynamic network) exist on the same plane — they are not separated as in your “reframing” diagram. A significant consequence of the difference between your and my approach is that I include a third dimension in addition to your “Business Processes” and “Business Information” categories. I see business users being served by composite applications mashed up from three service streams: Process Services, Content Services, and People Services. In my model, Traditional and Enterprise 2.0 functionality can exist in the same application and may be applied in the same use case. The goal is to design role-specific applications that support users efficiently and seamlessly, rather than forcing them to switch between multiple, disparate applications to accomplish work. I hope to publish these ideas soon, in the form of more complete thoughts and diagrams. In the meantime, I’d welcome your input on my approach and encourage you to keep working on your frameworks as well. By exploring the relationship of structured and ad hoc work from different angles, and discussing those differences as we are here, we should eventually design a framework that makes sense to both us and our clients. Finally commented on the blog post by @bn_at_twitter, http://is.gd/4q0L1, which was inspired by one of my posts, http://is.gd/4q0S8. looking forward to your published thoughts. I know that my thinking for this framing is limited as it focusses on one upfront intention for the E2.0 activity: improve the way you (re-)innovate in order to gain competiveness in the market. I think this is a major objective of a lot projects but certainly there may be others. Clay Shirky is still relevent. I appreciate the model of servant Leadership as well. Is E2 a revolution? Well I can tell you from the trenches of an enterprise collaboration tool called Cogenuity that the answer is YES! Pingback: n:sight // networked insights » Ist Social Messaging der E20-Treiber? Pingback: The Top 209 of 2009 « Concept HUB inc.